Hello! I am super excited to welcome you to the Eternal community. My name is Neon, and I will lead you through your introduction to Eternal. I have been playing the game since the beginning, and have written more about Eternal than anyone else. I know that when you are just starting out things can be confusing. I hope to help you with that! This guide should be useful to anyone coming from Magic the Gathering, Hearthstone, or even if you have never played any card games at all! I plan to link to a bunch of other resources, so you will have lots of additional stuff to check out. Let’s get started! 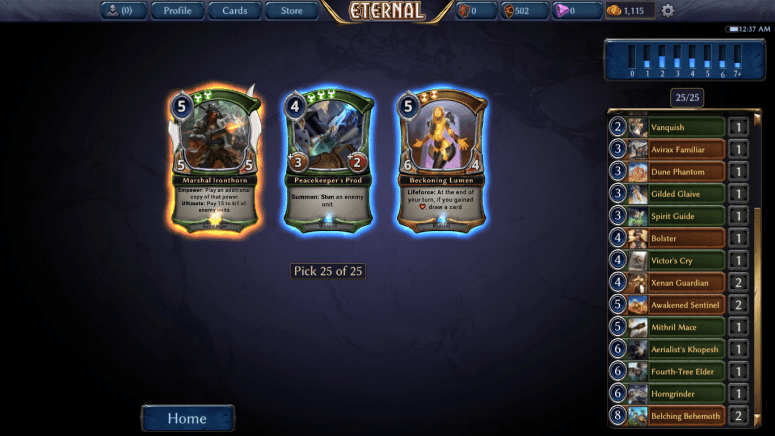 Thinking about starting Eternal, but not quite sure if you want to invest the time? I may be biased, but I truly think the game is amazing and it is only getting better. If I had to quickly summarize what the game was like, I would say it is a “fixed” Magic the Gathering, with the benefits of a digital play experience. There is amazing strategic depth and complexity, a compelling draft environment, and huge range of fun, interesting and powerful cards. There are also some sweet “digital only” mechanics that make Eternal extra fun. The game also allows a wide range of play styles. 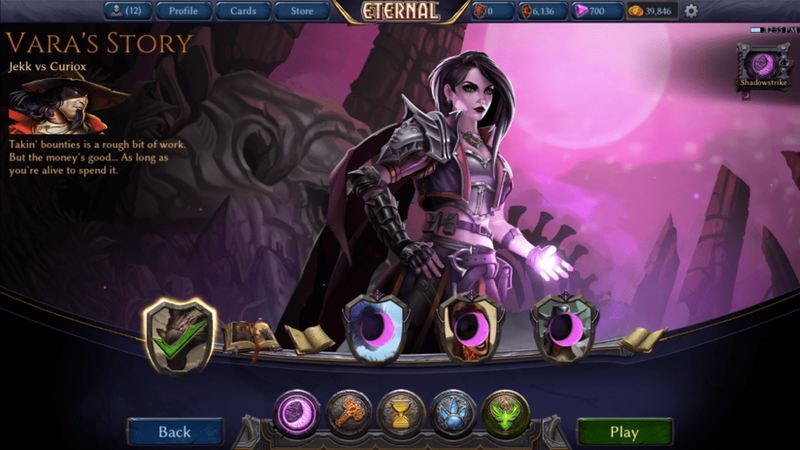 Whether you like beating down and burning face, controlling the board while drawing cards, or assembling whacky combos, Eternal has it all! The game is also extremely “free-to-play” friendly. It does not take long to build a competitive collection, and has a more generous “free-to-play” model than most other digital card games. Many people have at least one top-tier deck within the first couple of weeks of play without needing to spend a dime. The game is also growing! Dire Wolf Digital (DWD) – the company that makes Eternal – has told us they are planning to release more sets, is working on developing a competitive scene. It seems pretty clear that DWD is invested in the future of this game. I have also been blown away by the community. Whether it is debating strategy or goofing around, there are tons of people who are friendly and helpful. You can join the Discord here and the Reddit here. If you want to contact me directly you should join the A+Space Discord and message me at Neon#3989. If you enjoy games with a lot of strategic depth, it is certainly worth a try. Within 6-10 hours of play you should probably know if it is for you, and since the game is totally free, you have nothing to lose! If you are going to start playing, you should sign up through a “friend link”. This gives you some bonuses in-game over regular sign up, as well as bonuses to your friend. If you don’t have one you can find one right here! The first thing to do when you start Eternal is battle through the Campaign. If you are experienced in card games you should find it fairly straight forward (and maybe a little boring), but it will help to introduce you to many of the fundamentals of the game. It is possible to do other things after you finish the Shadow campaign (you need to do a Gauntlet run first, then you can do anything else), but you should probably just go through the other chapters of the campaign so you can get the cards. I should note that there are a couple of cards here that do not appear in the rest of the game, so if you later look for card XYZ you saw in the Campaign it might not actually exist. Some people have some issues with the final boss, which is a slightly bizarre battle. It takes place in 2 stages where you first get to defeat your opponent easily, but then the AI gets super-powered. For the second half just focus on surviving, since you will eventually draw the “Eternal Throne” card, which just ends the game. If you are having a lot of difficulty with this fight, check out LocoPojo’s video going through this match. Be sure to take the time to read what your cards do and try to understand the various keywords. I am not going to go through the meaning of all the keywords, since they are explained in the tool tips, or in the glossary (which can be found in the menu). Here is an articlethat explains some of the rules details of various mechanics that may not be obvious at first. You can also work through LocoPojo’s “Eternal Basics” videos, which spend more time on gameplay than I do here (Part 1, Part 2, Part 3). After you are done the Campaign, you are told to go battle in Gauntlet. You can use one of the decks from the Campaign or you can build something yourself. This is a good time to talk about the basics of building decks. First, go into the Cards menu. From here you see a menu where you can click on existing decks and look at their contents and/or edit them. You can also click on the “My Collection” button to just look through all the cards that you have. It is also possible to import lists from outside the game. For example, copy the following list then click on the “Import deck” then the “Clipboard” button. You should be able to import that and play it right now if you like! Anyway, before we get ahead of ourselves, let’s talk through some of the other functions in the deck builder. This button turns on “Crafting” mode. At present you are only going to see cards that you currently own, but if you turn on crafting mode you will see cards that you do not own. I would encourage you to just turn crafting mode on and flip through the collection to see what cards exist. Lots of crazy and powerful stuff to explore! Once that is done turn it off again and come back here. There are a number of tools that are useful for searching your collection. This search bar lets you search for cards of a specific name, or for any text on the card. As your collection grows this will be much more helpful. Currently I only have the Fire and Time cards selected, so I will only see Fire and Time cards in my searches. Want more detail in your search? The toggle that looks like a broken martini glass brings up the advanced search menu. This might be slightly unintuitive at first, so I encourage you to mess around with it. If you get confused and find that you can no longer see the cards you want go into the menu and click the “Reset Filters” button to go back to default view. In the basic deck builder the game gives you a pre-built mix of power cards for all of your decks. Among the community we often refer to your collection of power cards as your “powerbase”. Most people are not a huge fan of the “automatic power” feature, and switch it off immediately. If you click the “customize power” button a dialog box pops up that allows you to select your own power. You also use this decklist viewer to remove cards from a deck. If you click on the the Stonescar Maul, for example, it will be removed from your deck. FYI – decks must be at least 1/3 power, 1/3 non-power, and 75 cards in total, with a maximum size of 150 cards. You can change the portrait and the name of the deck. Click the title to change the title and the portrait to change the portrait. This is purely an aesthetic/organizational thing, and does not make any difference in the actual contents/function of the deck. Here we see the power-curve of the deck, which give you information about how many cards in your deck cost what amount. The magnifying glass gives us some additional options, let’s take a look! Right now the deck is organized alphabetically. You can switch this organization to organization by type by accessing the menu (the gear in the corner), opening the “Gameplay” screen, then turning on the “Enable Expanded Deck Categories” option. Remember how I gave you that decklist up above? Well this is how I got it! Click that button and your decklist will be copied to your clipboard so you can share it with others. There is all sorts of fancy information in here! All useful for understanding your deck. I removed the Sigils from my deck, so now I only have 4 power in my deck. You can click this “Add Power” button to automatically add Sigils to your deck. If you remove the Sigils from the deck (by clicking on the picture) and then press the “Add Power” button, you will have 11 Fire Sigils and 10 Time Sigils added to the deck. This function will only add Sigils to your deck, meaning it does not include important cards like Seats, Waystones and Banners. This means the automatic power function isn’t very good for most constructed deck. Do not rely on it too heavily. You can return to the normal deckbuilder screen through either the “Back” button or by clicking on the magnifying glass again. The “done” button takes you out of the deckbuilder entirely. Now that you have the basics, you should play around and build your own deck! Go back to the deck builder screen and build a new deck for yourself. You will need it for the Gauntlet! There is a ton to learn on the topic of deckbuilding, so if you want to learn more you can check out some articles by RNG and LocoPojo, or a Podcast episode I did on the topic. Now that we have the fundamentals down, what should you do next? I would suggest you first focus on getting Master in both Gauntlet and Forge (the versus-AI modes) and then switch over to Ranked and Draft. Climbing the ranks in Gauntlet and Forge will help jump-start your collection, but once you reach Master you should really only continue if you really like the PvE experience since you no longer get “rank up” rewards. CAUTION: DO NOT SPEND GOLD ON PACKS! THE BEST VALUE FOR YOUR GOLD IS TO ENTER FORGE OR DRAFT! This is quite different than some other games, and you can obviously do what you like, but Draft and Forge are much better value than just buying packs raw. Time to test your abilities! The Gauntlet is an AI opponent that you can battle for rewards. You pick a deck, and you are then set against a random AI. Each AI has a unique deck with a specific style of play. They are all fairly weak when you are beginning so you shouldn’t have too much difficulty beating them unless you get horribly unlucky or your deck is non-functional. You can then continue to play against different AI until you either lose once or get 7 wins. The final “boss” of the Gauntlet always has some whacky rule that is designed to benefit the opponent, although you may get lucky and find that it helps you more then them. Once you get 7 wins you “rank up”, which gives you a bonus reward, and the Gauntlet gets harder for next time. The Gauntlet AI is pretty dumb, plays very defensively, is easily tricked, and often “floods” out (“flood” is a term for when you draw too many power). Gauntlet is a great tool for testing new decks and building your collection. I would encourage you to get to Master in Gauntlet as you get a number of “free” packs along the way. Also, there is no need to finish a run all at once. You can wait weeks between your first and second games if you want! Want to quit a Gauntlet run so you can start again with a different deck? Go to the menu and click “Resign Gauntlet”. The ranking of Gauntlet resets whenever a new set comes out, rather than monthly like the Draft and Ranked standings. If you want to learn more about Gauntlet, check out this article by LocoPojo on the subject. Once you have dipped your toes into the Gauntlet, you can move along to Forge! In Eternal you will hear people talk about “limited” and “constructed” formats. Constructed formats are where you can build a deck out of any cards that you own and use that to battle whatever opponent you are facing. Gauntlet, for example, is a constructed format. A “limited” format is where you can only play with a subset of cards. In Eternal you also get to keep all the cards you get from limited games. As soon as you pick them they are available in your collection to play with. Forge is a limited format. You start off by getting a choice between 3 cards. You select the card that you want to play, and you must include that card in your deck. Now, when you select one of these cards, you are also secretly selecting you first faction. You then get another set of 3 cards to choose between. Once you select a second faction you now only see cards of the selected factions. For example, if you first picked and Wisdom of the Elders, and then second picked a Deathstrike, all of your cards will either be Primal, Shadow, both (like Feeding Time) or neutral (like Alchemical Blast). There are a total of 25 picks, and when you are done the program automatically adds power for you (there is no way to control this). If you want to look at or share your Forge deck you can open the “Cards” menu, select “Import Deck” and then click “Last Forge”. In each run of Forge you are guaranteed to get at least 1 rare or legend, but usually get 2. As a general strategy for Forge, especially when you are starting, I would encourage you to be a little on the greedy side in building your decks. Similar to Gauntlet, the AI is pretty dumb, rarely puts together an aggressive start, and has a very high chance of drawing too much power. As long as you have some early game, you should be able to survive to playing your 4, 5 and 6 drops. If you want to learn more about Forge, check out this article by LocoPojo, although I would note that his caution against faction pairs like Xenan (Time + Shadow) and Skycrag (Fire + Primal) is no longer applicable because of the release of Set 2. Each Forge run ends with 7 wins or 2 loses. Unlike Gauntlet, there is no “special” boss fight at the end. If you get 7 wins you will receive 4 packs of cards, as well as over 2000 Gold. This means you get your 25 cards (from the cards you chose) plus 4 extra packs of cards for the “effective” price of less than 500 gold! That’s great value! Once you hit Master the rewards drop substantially, since you no longer get the “rank up” awards. I strongly encourage new players to spend their gold on Forge until they reach Master, since the returns are so generous. After that, you should turn elsewhere to build your collection. Patch 1.23 introduced the puzzle mode, which offers you several dozen scenarios where you must win the game using an unusual assortment of cards. These may be challenging to a new player that is unfamiliar with the cards and the way mechanics interact, but this is one of the best ways to learn some unconventional interactions while racking up free gold. I think these were genuinely fun, so I encourage you to play through them yourself. I have written out the solutions to the first batch of puzzles if you are stuck, or if puzzles are really just not your cup of tea. 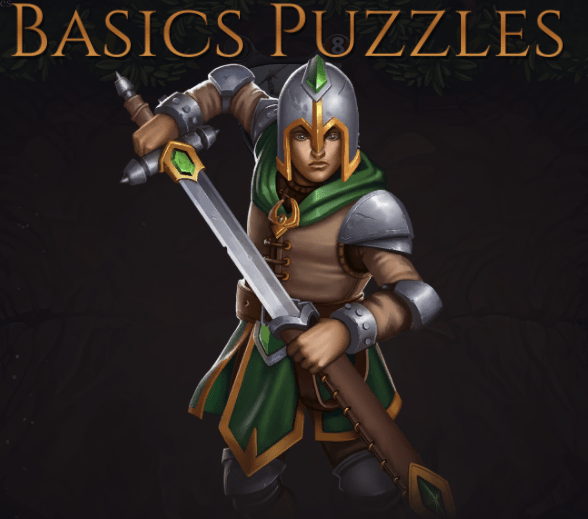 If you have reached Master in both Gauntlet and Forge as well as completing the puzzles, it is now time to really start playing the PvP formats. You have probably already completed some of your quests by this point, but “Ranked” or “Casual” is often the best place to complete them. You should get some of the “theme deck” quests relatively soon into your time playing. These are great for getting big batches of new cards, and can serve as the backbone for your own decks. If you look at the end of this article you will see my version of some “budget” decks that you can use to start climbing the ladder, or grinding gauntlet. The rewards system heavily rewards people who get at least 1 win a day in either Ranked or Casual, so I would make sure to keep up with that. It is best to focus your time in Ranked rather then Casual, as the rewards are better, and you might even find Ranked is easier if you are just starting. Once again, LocoPojo has written a great article on getting started in ranked that you should check out. Once you have hit master in Forge the best place to expand your collection is Draft. Draft costs 5000 gold, and is a limited format where you choose cards out of packs to make a deck. Once you pay your entry fee you are presented with a pack of 12 cards of Defiance cards. You pick the card you think is best, and you immediately get sent a new pack with 11 cards (still from Defiance). This pack is missing a card because someone else has taken a card from it already. You then select a card from the 11 card pack, and immediately see a new pack with 10 cards. You continue doing this until you get to 0, you now “open” a new pack. This second pack is made up of cards from the first three sets of Eternal, and are referred to as “Eternal Draft Packs”, the contents of which you can find here. Once “pack 2” is complete, you get another “Eternal Draft Pack” to draft, and finally another pack of Defiance. So, overall, draft a total of 48 cards through 4 packs of cards, 2 of which are Defiance, and 2 Eternal Draft Packs in the order Defiance-EDP-EDP-Defiance. As with Forge, you get to keep all the cards you pick. You then must build a 45 card deck with these cards, in addition to whatever Sigils you like. Most draft decks play either 17 or 18 power. If you are wondering where these packs come from (are these from real people? ), I touch on this in the FAQ. Note: it is much better value to enter draft than buy packs if you are looking to build your collections. I went through some of the math in another article, but the TLDR is that draft beats buying packs by a lot (especially if you are starting with a weak collection). It is hard to quickly summarize all the intricacies of draft here, as the topic is very deep, so please check out LocoPojo’s introductory article on the matter. You can also listen to the podcasts that I have done reviewing cards for draft. You can find my Set 1 reviews (with RNG and SirRhino) for Fire, Time, Justice, Primal, Shadow and Multifaction commons and uncommons at those respective links. There have been some changes since these were originally released, but most of the information is still useful. I also have a two part draft review of Omens of the Past (Set 2), which can be found here and here. My Dusk Road (Set 3) reviews with SirRhino can be found here and here in addition to our set review of Fall of Argenport (Part 1, Part 2, Part 3). Flash’s limited set reviews can be found on this site too (Fire, Time, Justice, Primal, Shadow, Multifaction). Draft is a challenging format, so if you are struggling with it at first don’t worry. There is a lot to learn, especially if you do not have experience from Magic: the Gathering. If you are having difficulty finding your footing in the format I would suggest watching some streamers or talking to people in discord. Draft is an extremely fun format once you get the hang of it. IS THERE GOING TO BE ANOTHER WIPE? No. There was a wipe to all game progress that happened when we went from closed beta to open beta, but DWD has said that will never happen again. There are some who claim that Forge/Gauntlet is “fixed” and that DWD uses some tricks to increase your chance of flood, or counter your deck. There is no real evidence of this, and DWD employees have plainly denied it on multiple occasions. Some people get salty about bad luck. SHOULD I PLAY CASUAL OR RANKED? TLDR – Ranked, but if you have “ladder anxiety” there is nothing wrong with Casual. As you will see going into the client, there are two types of constructed random match making. One is Ranked, which pairs you against opponents of similar skill level, and the other is Casual, which has much looser restrictions in match making. Players get 1 pack per day as a reward for the first win in either Ranked or Casual (that is 1 pack total, not 1 for each). If you are just starting out, I would suggest actually playing Ranked since you are more likely to be paired against someone with a beginner level collection/experience. Once you are out of Bronze league you can try Casual to get easy daily wins, though I doubt it will be much easier than Ranked. The prizing is also much worse in Casual compared to Ranked beyond the “Pack-a-Day” win. I generally think the only purpose of Casual is testing a whacky deck that still needs work before you take it into the Ranked queue. I do understand that “ladder anxiety” is real, which refers to people feeling a lot of pressure when playing against other players for points. If that is you, there is nothing wrong with taking it slow and just playing Casual. WHEN SHOULD I GET The Extra Campaigns? Eternal has four “bonus campaigns” that give extra cards that you only have access to through purchasing the campaigns. “Jekk’s Bounty” is the first, “Tale of Horus Traver” is the second, “Dead Reckoning” is the third and “Into Shadow” is the fourth. I would strongly suggest purchasing Tale of Horus Traver, Dead Reckoning, and Into Shadow as soon as possible (in that order), as you get access to a boat load of really powerful an interesting cards for a really good price. If you plan to spend money on the game buying these campaigns is by far the best way to invest in your collection. When to purchase Jekk’s Bounty is a harder question, since it depends on a few things. First, if you are spending real life money on the game, Jekk’s Bounty is pretty good value. Usually 1000 gems = 10,000 gold of value, but for buying Jekk’s bounty your 1000 gems = 20,000 gold in value! Next, if you really like PvE content, you may enjoy playing Jekk’s Bounty. I legitimately enjoyed playing this Campaign, so you might want to prioritize the purchase. If neither of those things apply to you, you can put off buying Jekk’s Bounty a long time, since there are very few decks that rely on the cards from this campaign. I would suggest saving up for it once you already have many of the Rares that you want, as well as a good selection of Legendaries. If you enjoy “Armory” style decks you might want to speed this up, since Quarry is a great addition to such lists (though not essential). I wrote an article on completing the Jekk’s Bounty campaign, which you can find here. ARE THE THEME DECKS WORTH BUYING? When you are starting out they are okay, especially if you are not confident in your ability to draft. Just the number of Commons and Uncommons that they give you is decent, meaning it can help jump-start a new collection. They are not essential, so if your prefer to make your own decks, feel free to skip them. WHAT IS THE CHANCE OF UPGRADING CHESTS? GETTING A LEGENDARY? There is a chance that Bronze, Silver or Gold chests upgrade to Silver, Gold or Diamond chests. A single upgrade happens about 10% of the time, or 1-in-10 chests. This is about the same chance as opening a Legendary card in a pack (the odds of opening a Legendary is the same in any type of pack). We have not gotten an official comment from DWD on the actual probability of getting a legend or a chest upgrade, but most people who have recorded large samples have found the chance is about 10%. Remember, just because this is a 10% chance doesn’t mean you “should” get 5 legendaries after opening 50 packs, or that your account is bugged if you don’t see a chest upgrade in your last 20 attempts. That is not how randomness works. SHOULD I PLAY EVENTS? SEALED LEAGUE? Events are special play experiences that are available for a limited time. The rules vary from Event to Event, so be sure to review the specific prizing and format that is being offered. As of right now, most events have been geared towards experienced players. If you are just starting up I worry that you might run into grizzled veterans who will show you no mercy. Obviously every Event is different, so it is hard to generalize too much, but I would encourage you to skip events at least until you can reach Diamond or Master. You should just spend your gold on Draft. “Sealed League” is technically classified as an event, and this is much friendly to novice and intermediate players. In case you don’t know, “Sealed” is a limited format where players open packs (8 packs in the case of Eternal) and build decks from the contents. In the Eternal Sealed League there are packs added to your Sealed Collection every week so your deck is changing a bit from week-to-week. You get prizes based on your placement in the league at the end of the month. Even if you miss the first week to enter the league, you can get in later and still receive all the packs you are entitled to. Sealed League is not great for those who are brand new since it is a large initial investment and you only see any prizes at the end of the month. If you are a little more experienced, or you like sealed deck, and have the gold/gems to spare, it is a decent place to invest. WHY DOESN’T [XYZ] WORK LIKE MAGIC/HEARTHSTONE? Because they are different games! There are a number of mechanics that are similar between these games, but the differences are important. I have worked with others to write a partial Rules Guide, and although it is not a fun read, it should answer some of your mechanical questions. The community on Discord is also a great resource! It is difficult to go over all of them here, but let’s run through some basic ones. Activated abilities – you can only activate abilities during your own turn during a non-combat phase, unlike Magic where you can (usually) do it at any time. Aegis versus Hexproof – Aegis protects against one spell or ability affect, while Hexproof makes something immune from targeted spells and abilities. This means that a unit with an active Aegis is protected from a Harsh Rule or Lightning Storm, while a Hexproof unit is not. Ambush versus Flash – Flash is a Magic ability that allows units to be played at any time an Instant can be played, while ambush has only very specific times. You can Ambush a unit in only 3 circumstances: while your opponent’s units are attacking and before you have declared blockers, at the end of your opponent’ turn, or during an ‘attack’ effect (Relic Weapons or Killer). When you Ambush in response to an attack effect it changes the target of the attack to the Ambush unit. You cannot ambush a unit in response to a Fast Spell, or during your own attack step, etc. Response windows – In Eternal, you cannot respond to equipping weapons or playing units. This means you might need to time removal differently than in Magic. A common example is using a Torch before your opponent has a chance to buff their unit with a weapon. Also, during combat after blockers are declared there is a window where both players have a response window for fast spells simultaneously, which never happens in Magic. It will take you a bit of time to get used to all these windows, since there are a number of small differences with Magic. Silence – Eternal’s Silence is less powerful than Hearthstone’s Silence mechanic. Eternal only removes the text on the card, so effects that give a bonus to the body (like Warcry bonuses) are not effected. If the text on the card is what gives the unit stats then the card will lose the stats. For example, a Timekeeper is a 0/0 at base, so silence effects will kill him! Silence also affects attachments on a unit. If you a silence a unit with a Permafrost the unit will become unstunned, or if you silence a unit with a Steelfang Chakram, the weapon will not go back to the owner’s hand after the units dies. HOW DOES THE REDRAW RULE WORK? WHY DO I NEED AT LEAST 1/3 OF MY DECK TO BE POWER? Your first hand is a random collection of cards from your deck, except it must have at least 1 power and 1 non-power card (power fetching effects like Seek Power count as non-power in these counts). If you redraw, your second seven-card hand will either have 2, 3 or 4 power (1/3 chance of each), and the rest will be non-power cards. You can send this back and get a 3rd hand which follows the same rules as the second except you only get 6 cards. You must keep the third hand. Since Eternal uses this special redraw rule you are forced to have 1/3 of your deck be power cards, since if this was not the case you could build decks that abused this rule, such as only playing 4 power in your entire deck. HOW DOES [ABC] INTERACT WITH [XYZ]? Unfortunately we do not have an official comprehensive rules guide. I published an unofficial Rules Guide, though it is fan-created, meaning it is not verified by DWD, and it is incomplete. Your best bet in many cases is to ask Discord. LocoPojo also wrote an introductory article on some common interactions, though the scope there is limited. CAN YOU DROP OUT OF RANKS? Nope. You can lose as much as you want, but your rank will never fall below whatever “league” you are a part of. HOW DO END OF SEASONS REWARDS WORK? At the end of the month you get rewards based on your final rank at the end of the month. You get a separate reward for both Draft and Ranked, so you should try and get as high as possible in both every month. The rewards are shown below. Note: there is no difference between something like Diamond I and Diamond III in rewards, and you don’t get any extra bonuses from being high or low in Master at the end of the season. WHERE DO DRAFT PACKS COME FROM? Real people! The system is known as asynchronous draft. At the start of the draft you open up a fresh pack and pick a card. You then get a pack from someone who has already finished drafting. They could have finished 5 minutes ago they finished, or 5 weeks, but they have already finished drafting. You then continue to receive packs from that same person for the remainder of pack 1. Once you finish pack 1 you receive a fresh pack 2. Your pack 2 pick 2 comes from a different person than pack 1. That person is selected via a matching algorithm. We are told that it respects “signals”, meaning that it attempts to predict what factions you are. For example, if you are passing good Shadow cards and taking all the Justice cards, you are likely to see more Justice than Shadow in pack 2. We know very little about the algorithm, but it is safe to say that “signals” matter, hopefully matching you to someone passing the cards you want. Once pack 2 is done, you get another fresh Eternal Draft Pack that was drafted by the same person that saw your pack 2. Pack 4 you receive cards from the same person who was passing to you in pack 1. To summarize, the packs are drafted in the order of Defiance-Draft Pack-Draft Pack-Defiance, which were previously drafted by person A-B-B-A. You can spend Shiftstone to craft new cards, and you get Shiftstone for destroying unwanted cards. You can look in the client to find all the values. It is very difficult to answer this question in a general fashion, since there is a whole lot of “it depends” going on. As a rule of thumb I would say you should never destroy any commons or uncommons until you have a “playset” (which means 4, since that is the most you can play at once). Even premium commons and uncommons are barely worth any Shiftstone, so it is not really worth trying to scavenge your collection for a couple extra Shiftstone unless you are only 10 or 20 away from that fancy rare or legend you want. For rares and legends you should check popular decklists to see if the card is played. Cards like Mind Link or Idol of Destran can be destroyed with no concern, while destroying Sandstorm Titans is deranged until you have 4. Everyone has their own “line” in determining what they what to destroy versus keep. Ask around in Discord for a second opinion when in doubt, since most cards are pretty obvious. Same goes for crafting cards, although the best cards to start with crafting should be fairly obvious after playing Ranked for little while. Avoid crafting commons and uncommons past your first couple of days, since you should get a playset of everything without too much difficulty. WHY IS [XYZ] CARD SO GOOD? There are a few cards that can seem totally bonkers when people see the for the first time. Sandstorm Titan and Tavrod are probably the most obvious examples, as they each have tons of stats in addition to powerful abilities. There are lots of other examples too. I have written 2 articles on the subject, one discusses “pushed card“, explaining what the term means and why it is a good thing, and another article discussing Sandstorm Titan in depth. These are fairly technical, but it may give some insight into card design that you had not considered. TLDR: pushed cards enhance gaming experience. I KEEP ON LOSING TO DRAWING TOO MUCH OR TOO LITTLE POWER. WHAT GIVES? Power flood and power screw are part of the game that cannot be avoided. It is an inherent element of the game engine, which doesn’t always feel great. As you get better at deck building and playing you will experiences these issues less, but at some level you need to accept that these things happen. If you are too frustrated by this… well… maybe Eternal isn’t for you. I don’t expect DWD is going to take any radical steps to stop this from happening in the near future. WHAT DOES [SLANG TERM] MEAN? Many of the people in the Eternal community come from Magic the Gathering (and to a lesser extend Hearthstone). There is a lot of jargon that comes from other games that we are used to, but could be new to you. I have included a quick glossary of terms that you might not know at the very end of this article. There have been some other articles focused on building budget decks (like this one by SirRhino). Although some are slightly out of date, they are still functional. I wanted to just share a couple for you right now. All of these decks are composed entirely of commons and uncommons, or rares that you can acquire from starter decks and free theme decks. All three of these decks can be upgraded to top tier competitive decks that you can build towards. This deck is a mix of efficient low cost units, weapons, and a few tricks for getting around blockers. Warcry units help build up advantage as the game does on, while staying aggressive. This play style can take you all the way to the top of Master, and is one of the cheapest competitive decks to put together. You can find a competitive Rakano deck here if that is what you want to build towards. This is just a deck built around playing big dummies, and hitting your opponents with them until they die. There is not a ton of nuance to the deck, since it is just a curve of overstated monsters, but you don’t always need to be clever, you can just be bigger! Mono-time is a viable archetype even at high level master, though you will need to invest in legendaries like Sandstorm Titan. Here is a competitive list to build towards. This deck is also similar to Praxis Midrange or Elysian Midrange in play style. Although it is somewhat difficult to build great control decks with a limited collection, I know there are a lot of people who really like this play style. This deck should offer a reasonable start, though you should be prepared to adjust your mix of removal spells to focus on the threats you are seeing in your section of the metagame. You really want to craft some finishers for this deck as soon as possible (Champion of Cunning be the best, followed by Black Sky Harbinger), as the options available at Common and Uncommon are pretty bad. Feln control is playable to master, though you will need to invest pretty heavily. Here is a master level Feln control deck that you can build towards. Discord – the best place to connect with the community is the Discord server. For those who have not used it before, Discord is a chat server. For Eternal it really acts as the core of the community. One of the best places to discuss the game, make friends, or ask questions. You can also join the A+Space Discord here! 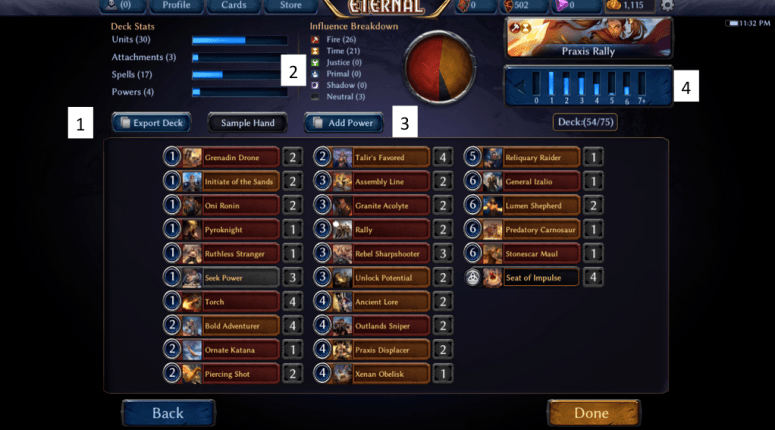 Eternal Warcry – this is a great resources for decklists. If you want to look around at what other people are brewing and playing, this is a fantastic place to browse. They also write articles that are worth checking out. Reddit – If you have spent any amount of time on the internet, you should know what Reddit is. Well, we have one, and you should come and join! The stickied beginner questions thread is particularly helpful. Tournaments – The most popular tournament events that are happening right now are run by RNG Eternal. You don’t need to be experience to sign up, but most people who attend are seasoned veterans. These happen (almost) every Saturday at noon (EST). Some other tournament organizers exist, and if you ask around you can get some more information. DWD runs their own tournament series, with big prizes, so you should keep your eyes peeled for what is going on there. Twitch – Come check out some of the best of the game battle for glory, or LightsOutAce battle for the memes! Lots of great content here at almost any time. Not only do you get great streams, you can even get cards from Twitch drops! My personal stream can be found here, and I would appreciate it if you dropped a follow. I would also specifically suggest the RNG stream on Saturday afternoons (EST) as you can check out the Eternal Tournament Series! Well, I hope that has given you enough to start. I know that is a lot of information, but there is a lot to know! If you have any questions feel free to contact me in the A+Space Discord (Neon#3989), or you can use the #beginner-questions channel in Discord, or the “Beginner Questions Thread” on Reddit. You can also find me on Twitter! Best of luck in your quest for the Eternal Throne! Bolt – People will sometimes call Torch “Bolt”, since it is essentially the exact same as the card Lightning Bolt from Magic the Gathering. Bounce – any effect that sends a unit back to its owner’s hand is a “bounce” effect. Teleport and Praxis Displacer are examples. Cantrip – an effect that draws a card, usually a small effect. Levitate is a classic example of a Cantrip. Chump Blocking or “Chump” – Chump blocking is the act of blocking a larger unit with a smaller one for the purpose of saving life. It is generally avoided when possible, but is necessary in the face of large attackers. A “chump attack” is related, where you attack with a group of units where one or more will likely be eaten up in the attack, but you get to deal some damage. Creature – Magic term for unit. Cut, or “getting cut” – This has two meanings, both relating to draft. The first meaning is when a faction is being taken by another drafter so that you do not see it. For example, if the person before you is taking all the good Fire cards you would say that Fire is being cut. It is best to avoid factions that are being cut. Cuts can also refer to removing extra cards from a deck (“I have 47 cards in my draft deck! Which 2 should I cut?”). Darude – Eternal slang for Sandstorm Titan. Decking – In Magic, if your deck is Empty and you are forced to draw a card, you lose the game. If that happens it is referred to as getting “decked”. In Eternal the rule is that you lose at the end of your turn if you have no card in your deck. Disenchant – Depends slightly on the context. Usually refers to destroying excess cards for Shiftstones (similar to “Dusting”), but can occasionally be used to refer to cards that destroy attachments (Decay is a “disenchant” effect). Dust or Arcane Dust – Hearthstone has a similar economy to Eternal, but their Shiftstone equivalent is referred to as Arcand Dust, or just Dust. “Dusting” refers to destroying unwanted cards for Shiftstone. Durdle – Doing something that is slow and plodding, but gains value. A card like Crystalline Chalice or Explorer Emeritus are very “durdly”. It is not necessarily good or bad, but is very slow. Fatigue – In Hearthstone, if you draw a card from an empty deck you take damage, which increases as you are forced to draw more cards. That damage is called Fatigue damage. In this game you just lose the game if you end your turn with no cards in your deck. Flash, or “to flash in” – Magic has a mechanic that is similar to ambush known as flash (though there are some important differences). To “flash XYZ in” means to play it with its ambush ability. Flood, or “to flood”– drawing too much power. HS – Abbreviation for Hearthstone. Mana-screwed – The power system in Eternal is very similar to the Mana system of Magic. Being mana screwed means you are missing some of your influence requirements, or do not draw enough power to operate. Milling – The act of discarding cards from your deck into your void is referred to as “milling”. In Magic the Gathering, some decks would try to win via decking (see “decking”), and would use “milling” effects on their opponents to speed up this process. Decks which are built around void synergies in Eternal may use “self mill” effects like Sporefolk and Means to an End. Minion – Hearthstone term for unit. MTG – Abbreviation for Magic the Gathering. Mulligan or “Mull” – In Magic, redrawing is referred to as “taking a mulligan”, “mulliganing” or just “mull”. “Should I mulligan?” means “should I redraw?” in Eternal terms. Pump spell – Cards that enhance your unit temporarily. Finest Hour or Rapid Shot are common examples. Set 1/2/3/4 – This is the short terms for the expansions of Eternal. Set 1 is “The Empty Throne”. Set 2 is “Omens of the Past”. Set 3 is “The Dusk Road”. Set 4 is "Fall of Argenport". Tap, “Tapped out” or Untap – A unit being exhausted in Eternal is very similar to something being tapped in Magic. The term “tapped out” refers to having no power available. If a player is tapped out it implies their opponent has a lot of freedom to do what they like. When someone replenishes their power at the start of their turn it can be called “Untapping”. Tokens – In Magic the Gathering, there are many cards like Hordeling Outburst that make “fake” units, that are like normal units in most respects, but have a slightly different rules. Cards like Assembly Line in Eternal make units in a similar way to Hordeling Outburst. These units have the exact same rules as normal units, but many will still refer to them as “tokens”. Players will also refer to “Tokens decks”, which play a lot of go-wide effects like Assembly Line or Scouting Party. Trample over – Overwhelm is a very similar mechanic to trample from Magic. Excess damage that is dealt to the player is said to “trample over”. Trick, or “having a trick” – fast speed interaction that can alter combat. This is usually in the form of pump spells, fast removal, or occasionally ambush units. Finest Hour is a classic example of a trick. Wrath – Refers to killing all of the units on board. Comes from this Magic card.